THERE ARE ESSENTIALLY THREE REASONS to write a memoir: for money, for literary value, and for vindication. Neither of the first two applies to Donald Rumsfeld. Having made a bundle as CEO of G.D. Searle (the maker of NutraSweet), he has no apparent need for more; in any case the proceeds from his memoir are to be donated to charities helping American service personnel. Nor is there any artistry apparent in the writing: like most politicians’ books, this one is clunky and inelegant. If Rumsfeld has any pride of authorship, he hides it well. His acknowledgements suggest that no fewer than three people contributed to the writing while eleven more checked facts, transcribed dictation, and acquired documents and illustrations. The result reads, not surprisingly, more like a memo written by a team of clever if unprincipled publicists—“The Case for Donald Rumsfeld”—than a genuinely reflective memoir that tries to delve into the author’s inner life and come to grips with the decisions he made and their consequences. No doubt Rumsfeld was motivated to write with Churchill’s (apocryphal) dictum in mind: “History will be kind to me for I intend to write it.” Churchill was such a powerful polemicist and successful statesman that he largely achieved his ambition; it would not be until decades later that historians would unravel the self-serving spin of his magisterial, six-volume The Second World War. Donald Rumsfeld, needless to say, is no Winston Churchill. If the initial reviews are any indication, his memoir will do nothing to rescue the reputation of a man who is destined to be remembered as one of the two worst secretaries of defense ever—exceeded, arguably, only by Robert S. McNamara, whose missteps cost far more American lives. Although it scarcely seems possible, Known and Unknown may even lower Rumsfeld’s standing. The book is certainly revealing, but mainly in ways that are unintentional and unflattering. It does help to answer the riddle of how someone who seemed so supremely qualified for high office—a man who had served previously as a congressman (in the 1960s), White House aide and NATO ambassador (for Richard Nixon), White House chief of staff and secretary of defense (for Gerald Ford), and corporate chieftain —how a man with such a sterling resumé could be such a miserable failure in managing the wars in Afghanistan and Iraq, both of which we were losing by the time he left office. To find the answers to this mystery, you have to read between the lines. You have to look beyond his flimsy and unconvincing rationalizations to see revealed a self-made Princetonian of surpassing arrogance, a collegiate wrestler who turned into a master of bureaucratic gamesmanship but failed to manage or lead effectively, a senior official who undermined his superiors and aggravated his underlings, who deferred to the incompetent and second-guessed the competent, and who in the final analysis refused to take responsibility for momentous decisions. Known and Unknown is destined to be remembered as a masterpiece of buck-passing and score-settling written by a man who seems to shrink in stature with every page. In other words, all this mock-philosophical reflection is really a not-so-subtle plea on behalf of Donald Rumsfeld. I did the best I could based on the information I had; don’t judge me too harshly. Rumsfeld would be more sympathetic if he were to come out and just throw himself on the public’s mercy. But contrition and humility are utterly alien to the cocksure former Navy fighter pilot who is forever poking his finger in someone’s chest, literally or metaphorically. By invoking the limitations of human knowledge, he is merely providing an alibi for his own failures, without quite coming out and saying so. To err is human, but some people err more than others. Rumsfeld has two glaring blemishes on his record—Afghanistan and Iraq—that cannot be explained away by citing the limitations of human reason, especially not when he ignored the advice of many who warned him that he was not sending enough troops or making a big enough commitment to nation-building in either country. One of the most astute critics was Senator John McCain, who was warning as early as the summer of 2003 that we needed a bigger force to stop a growing insurgency in Iraq. His reward is to be sneered at by Rumsfeld, who describes him as “a man with a hair-trigger temper and a propensity to fashion and shift his positions to appeal to the media.” McCain, like the rest of us, is not gifted with omniscience, but on Iraq he was right and Rumsfeld was wrong. So, too, Rumsfeld’s successor: Bob Gates, is hardly superhuman, but he has been widely acclaimed for having a far more successful tenure—in other words, for making better decisions when confronted with the same sort of problems that confronted Rumsfeld. Blame not humanity, Rummy; look within for your failings. But of course he will not. Virtually the only mistakes he concedes are public relations blunders. He is sorry that, when he was asked on April 11, 2003, about looting in Iraq, he replied, “Freedom’s untidy. Free people are free to make mistakes and commit crimes and do bad things…. Think what’s happened in our cities when we’ve had riots, and problems, and looting. Stuff happens!” He is sorry not because the comment was actually “callous and indifferent” but because it was “characterized” that way by “the media.” He then segues into an attack on the press for “grossly false and harmful” reports about the looting of the Iraqi National Museum in Baghdad, which he claims, with considerable chutzpah, were responsible for “the negative pall that quickly engulfed the coalition’s efforts”—as if The New York Times and CBS News, rather than Donald Rumsfeld and Tommy Franks, were responsible for not imposing order in postwar Iraq. His real failing, he implies (and not for the last time), was in not realizing how unfair and how unprofessional the media would be. Instead of offering genuine contrition, Rumsfeld tries to whitewash his own mistakes with an artful reworking of the historical record. His first two chapters describe his work in 1983 as a special Middle Eastern envoy for Ronald Reagan. Following the bombing of the Marine barracks in Beirut, he spent a few months -- between November 12, 1983, and March 29, 1984 -- traveling around the region to meet with various leaders including Saddam Hussein—an occasion that produced a widely circulated photo of the two men. Why does Rumsfeld begin this account of his long life, which included service at the highest levels of government, with a minor episode from 1983-1984 involving five trips which accomplished nothing? And why does he bother to include a two-page map with a bewildering array of lines drawn across the Middle East to represent his travels? He doesn’t say, but my guess is that this prologue is intended to paint Rumsfeld as someone who had been engaged in, and knowledgeable about, the Middle East and terrorism since long before September 11. If so, this portrayal does not tally with the “known knowns”—namely, that Rumsfeld’s only substantive involvement in defense policy in the 1990s involved leading commissions looking at ballistic missile threats and U.S. space policy. He came into the Pentagon in 2001 determined to build missile defenses and other high-tech weapons systems while further cutting back army manpower, already much reduced after the end of the Cold War, which he looked upon as an impediment to lean and agile operations. This was his "revolution in military affairs." His primary focus was on the threat from nation states such as Iran, North Korea, and China—not on terrorist groups such as Al Qaeda. With no particular expertise or interest in the Middle East or counterinsurgency operations, he did not place any priority on preparing the armed forces in those areas. Soldiers would pay a heavy price for this lack of preparation in Afghanistan and Iraq, even as Rumsfeld insouciantly proclaimed that “you go to war with the Army you have—not the Army you might want or wish to have at a later time.” In short, his agenda upon assuming office had little relation to the threats that would consume most of his tenure—but, despite his meditations about the limits of human knowledge, he would like us to believe that he was actually well prepared for the post-9/11 world because of a part-time diplomatic mission that he performed seventeen years before. I have already noted two major attempts to mislead the reader—and we have gone no further than the first thirty-four pages of this 811-page tome. The early parts of Known and Unknown continue to reveal an enormous lack of self-awareness on Rumsfeld’s part. When he describes his ascent from a lowly congressional aide in the 1950s to defense secretary in the 1970s, he writes lines that will make jaws drop. For instance he describes a meeting he attended, along with other congressmen, in the 1960s, at which President Johnson defended his conduct of the Vietnam War by “suggesting that the military knew best and others ought not to question the military brass.” Rumsfeld recounts that he was skeptical of this attempt to deflect criticism—but a few decades later he would be making virtually identical arguments to deflect criticism of his own policies. He also remembers being unconvinced by Johnson’s “elaborate and rambling effort to cast blame for the unhappy situation wherever [he] could”—which is precisely what Rumsfeld does in this book. He even reflects that Johnson “probably would have been better off if he had never taken the vice presidency. He might have become known as the most effective Senate leader in history.” Surely I am not the only reader who thought, reading this passage, that Rumsfeld would have been better off never becoming secretary of defense for a second time, leaving himself to be remembered for his initial tenure in the 1970s. Apparently it never occurred to Rumsfeld that anyone might attribute to him the same failings he imputed to Johnson. This is worth keeping in mind later on, when Rumsfeld writes that he “welcomed and made a point of encouraging different views, dissent and challenges.” This is a man who has little awareness of how he comes across to others. He may have thought that he welcomed “different views,” but the prevailing view in the Pentagon was that he expected lock-stop conformity and punished those who disagreed with him. Whatever Rumsfeld’s intentions, he cannot escape blame for creating a climate of fear within his own department, and for needlessly alienating senior military officers, especially in the Army. The results of Rumsfeld’s failure to heed alternative views (such as those voiced by Senator McCain and legions of other critics) are by now well known. He stayed on a disastrous course in Iraq, which was not reversed until he was removed from office in 2007, along with two senior generals whom he had appointed. Less understood, even now, is that Rumsfeld inflicted a similar disaster on Afghanistan. By refusing to increase troop levels after 2001, he allowed the Taliban to get back on their feet and to mount a major offensive, beginning in 2006, that is only now starting to be checked by another troop surge that he undoubtedly would have opposed were he still in office. On a few occasions Rumsfeld sort of concedes, through gritted teeth, that he might have done better to send more troops to Iraq. “In retrospect,” he writes (ignoring the fact that many were making this argument at the time), “it’s possible there may have been times when more troops could have been helpful.” (The italics are mine, the weaseliness is his.) But no such concession is forthcoming in the case of Afghanistan, which he still claims was a roaring success for his favored “small footprint” approach because violence was low from 2002 to 2006. He ignores the fact that this was the period when the Taliban recuperated from the defeat they had suffered in the fall of 2001. When they went back on the offensive, they found little to stand in their way because Rumsfeld had decided to keep small the size of both U.S. forces (20,000 troops in 2006, a fifth of the current level) and of the Afghan National Army (36,000 soldiers in 2006, a fourth of the current level). Moreover, Rumsfeld refused to use American troops for nation-building. He believed that, rather than relying on U.S. forces to expand the authority of the central government, Hamid Karzai “needed to learn to govern the Chicago way”: that is, “he should learn to use patronage and political incentives and disincentives to get the local Afghan warlords, governors, and cabinet officials in line.” Karzai learned that lesson all too well. He now presides over one of the most corrupt governments in the world. His decision to empower crooked powerbrokers and warlords, made with Rumsfeld’s encouragement, has become one of the Taliban’s strongest selling points to a disaffected populace. However rooted in personal rivalries, some of his criticisms of Rice’s management style ring true: “The most notable feature of Rice’s management of the interagency policy process was her commitment, whenever possible, to ‘bridging’ differences between the agencies, rather than bringing those differences to the President for decisions.” This made it difficult to formulate clear-cut policies. But the truth of these observations does not absolve Rumsfeld of contributing to the policy chaos by engaging in relentless internal warfare with the State Department, and by refusing to allow the NSC adviser—first Rice, then Stephen Hadley—to effectively supervise his activities. Known and Unknown conveys a small flavor of what an unpleasant and exasperating colleague he must have been. He is particularly graceless when he writes of Rice: “As encouraged as I was that Rice seemed to enjoy Bush’s trust and confidence, I knew the burdens of the job of national security adviser were taxing for even the most seasoned foreign policy specialist and could be particularly so for someone with modest experience in the federal government and management.” As if Rumsfeld, with his more extensive experience, did any better. Such a condescending attitude must have grated on Rice—and on many others. Colin Powell and his deputy, Richard Armitage, are also major targets of Rumsfeld’s ire. Powell’s State Department, he writes, “seemed to remain skeptical about President Bush and less than eager to implement his policies.” This may be true, but the same criticism applied to Rumsfeld himself. A few pages after having excoriated Powell for disloyalty, Rumsfeld explains that he opposed Bush’s freedom agenda: “I did not think resolving other countries’ internal political disputes, paving roads, erecting power lines, policing streets, building stock markets, and organizing democratic governmental bodies were missions for our men and women in uniform.” Accordingly, even though the commander-in-chief had made the establishment of democracy one of the objectives of Operation Iraqi Freedom (“the transformation from dictatorship to democracy will take time,” Bush said on May 1, 2003, “but it is worth every effort”), Rumsfeld chose to pursue a narrower agenda and did not send enough troops to implement a sweeping political transformation. This was a far more destructive act of insubordination than the petty press leaks that he accuses Powell and Armitage of orchestrating. Yet Rumsfeld was hardly opposed to the top-down approach at the time. As former CPA officials Dan Senor and Roman Martinez have noted, Rumsfeld drafted a set of “Principles for Iraq—Policy Guidelines,” now posted on his website, which included the following: “The Coalition Provisional Authority will assert authority over the country…. It will not accept being defied—it will not accept or tolerate self-appointed ‘leaders’.” That Rumsfeld does not mention these words in his text is indicative of how selectively he draws on his ample store of memos, many of them written, one suspects, for the express purpose of providing him ex post facto cover in case anything went wrong. In any event, Rumsfeld’s claim that empowering unelected Iraqis faster would have improved the situation is pretty dubious. In 2004, the United States did create an interim Iraqi government under Ayad Allawi, but violence continued to spiral out of control. There is little cause to believe that an Allawi-led government would have been any more effective in 2003 when the principal organs of the Iraqi state—the police and army—had fallen apart and not enough American soldiers had been sent to keep order. For all his criticisms of Bremer, Rumsfeld essentially endorses Bremer’s two most controversial decisions: purging the Iraqi state of many Baathists and dissolving the Iraqi army. Many have argued that it was these decisions, which cast loose a large, disaffected population of former army officers and state officials, that led to the rise of an anti-American insurgency. Yet Rumsfeld admits that he and other defense officials were briefed on these plans in advance and did not object. Indeed, he backs up Bremer’s claim that the Iraqi army “disbanded itself,” which ignores the fact that some units might have been reconstituted and that the process of forming a new army might have been given a much higher priority. No question, Bremer was out of his depth trying to supervise a country he had never visited; he had scant experience in running large organizations and in dealing with Arab society. But he was in many ways a victim of the lack of planning and resources for what the military calls “Phase IV”—post-invasion stabilization operations. Whose fault was that? Considering that Rumsfeld fought for and won a decision from Bush that the Department of Defense should be given complete authority over all aspects of Iraq, he is hard put to escape censure. He tries, all the same, by insisting that Bremer was not really his man. Why, Bremer talked directly to Bush, Powell, and Rice, so how could anyone hold Rumsfeld accountable for his actions? But his excuses ring hollow given the fact that Rumsfeld remained one of the senior members of the Cabinet and the direct boss of all the American troops in Iraq. If he had wanted, surely he could have moved American policy in a different direction. Instead he allowed the situation to drift for a scandalously long time. This raises an interesting question about Rumsfeld. He acquired a reputation within the Pentagon as a micromanager who bombarded his subordinates with 20,000 memos known as “snowflakes” on subjects big and small. He even tinkered with the deployment schedule for minor military units being sent to Iraq. But now he claims that his major failing was delegating too much authority. “Contrary to popular perception,” he writes, “I was not inclined to issue direct, detailed, not to be questioned orders to those who work for me.” So which is it? Was Rumsfeld a micromanager or not? The evidence indicates that he could be very hands-on in dealing with some matters, particularly in defending the prerogatives of his office against rivals and subordinates, but that on the biggest issues of war and peace he was much too hands-offs. “To my headquarters back in Kuwait,” he said. “Well, aren’t you in charge of what’s going on in Iraq?” I asked. McKiernan told me he went in and out of Iraq once, sometimes twice a week to check on things. It struck me that in the crucial weeks following the fall of Saddam, McKiernan did not seem to think of himself as the commander in charge of the ground operations, and didn’t seem to be preparing to take over command of all coalition forces in the country, as Franks had indicated in HIS cable. That meant that the senior American military leadership in the country consisted of Army and Marine division commanders. It is telling that only by a chance meeting on an aircraft did the Secretary of Defense discover that no senior general was running operations in Iraq. Even more telling is how little he did about it. McKiernan, who should have been fired on the spot, would later resurface as the NATO commander in Afghanistan. 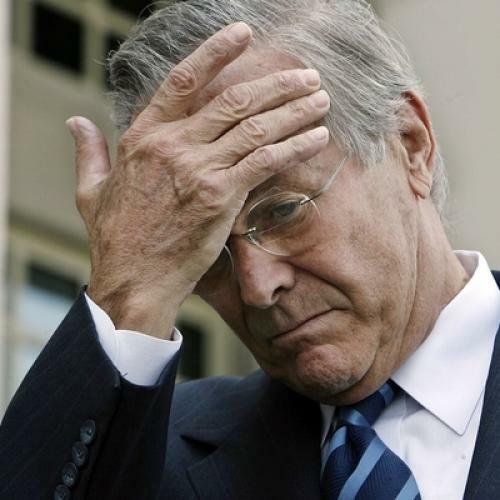 “My concerns about the military’s management of Iraq in the first days of the critical postwar period were abated somewhat,” Rumsfeld says, “when I learned that there would finally be a full-time military commander.” Note the passive sentence construction—“I learned”—which suggests that he was not involved in making this pivotal decision. The man chosen for the job was Lieutenant General Ricardo Sanchez, who, as Rumsfeld notes, was “not only the most junior three-star general in Iraq, but the most junior three-star in the entire U.S. Army.” Rumsfeld concedes that running Iraq at such a delicate moment required “a senior military official with far more experience.” So why didn’t he appoint one? That is a mystery that goes unanswered here. As usual, he lays blame elsewhere: “That the Army leadership, with the agreement of acquiescence of CENTCOM and the Joint Staff, slotted him for the top command post was a serious misassessment.” He writes as if the army leadership, CENTCOM, and the Joint Staff did not answer to him. But they did. He could have picked any general he liked to head operations in Iraq. Instead he allowed the selection of an obviously unqualified candidate without doing anything about it. Making the situation worse was that the military services did not provide Sanchez nearly enough officers or resources to run a corps-level headquarters to command more than 100,000 troops. Rumsfeld claims that he did not become aware of this problem until the exposure of the Abu Ghraib scandal in April 2004. To show how he addressed this deficiency, he quotes a memo he subsequently wrote to the chairman of the Joint Chiefs of Staff, General Richard Myers: “It seems to me we have a real problem. A combatant commander asks for something. The Joint Staff agrees to it. You recommend it to me. Then the Services never fulfill it.” If you turn to the footnotes you discover that the memo in question is actually dated November 1, 2004—seven months after the exposure of Abu Ghraib and five months after Sanchez had already left Iraq. Is this really the first time that Rumsfeld discovered how under-staffed and poorly led the military command in Iraq was during the critical first year of the occupation? If so, this is an almost unbelievable dereliction of duty on his part. And now he has the gall to blame his subordinates for these disastrous decisions which cost so many American and Iraqi lives. Perhaps Rumsfeld’s worst quality was his stubbornness. Anyone can make a mistake but he stuck with a misguided policy in both Iraq and Afghanistan for year after year—long after his serious errors had become apparent to the rest of the world. Indeed, to judge by the evidence of Known and Unknown, he still has not abandoned the catastrophic theory that guided his management of the Iraq War between 2003 and 2007. Call it the “antibody theory.” It was based on Gen. John Abizaid’s unproven assertion that U.S. troops were an antibody in Iraq and that the faster we downsized, the better, so that the Iraqis could sort out of their own problems. This was a plausible theory in 2003, but it grew less and less plausible over the years. In accordance with the antibody theory, we concentrated our troops on giant Forward Operating Bases where they were cut off from the Iraqi population and hence presumably less of an irritant. Far from decreasing violence, however, this led to ever-increasing bloodshed, as Sunni and Shiite extremists used the resulting vacuum of authority to bring Iraq to the brink of all-out civil war. The experience of the surge in 2007-2008 showed that American forces were not helpless to resist this rising tide of blood; all that was required was to beef up troop strength and order the troops to protect Iraqi civilians where they lived. But General George Casey and General John Abizaid—the senior commanders in Iraq—refused to give those orders, and Rumsfeld refused to override their obviously flawed judgment. “I raised the question of whether we had appropriate resources when I visited Iraq and in regular conversations with Myers and Abizaid,” Rumsfeld recounts. They assured him there were plenty of troops, so he left it at that—even as violence went up, up, up in 2004, 2005, and 2006. Rumsfeld seems to think that because “we actively weighed the merits of deploying more troops,” it was almost as good as actually deploying more troops. He even made a comically inept effort to solicit dissenting views. On January 3, 2005 he wrote to Gen. Richard Myers and Gen. Peter Pace, then the chairman and vice chairman of the Joint Chiefs of Staff. He asked them to tell him what “commanders at various levels think” and to include “minority opinions.” He writes, deadpan: “I did not receive any responses that they wanted more forces or that they disagreed with the strategy.” What a surprise—the two most senior officers in the armed forces did not bring forward any subordinates to tell their civilian boss that the strategy they had all agreed on was failing! If Rumsfeld thought he would get another answer, he was a surprisingly clueless manager. More likely he is simply being disingenuous. There was no lack of arguments being made in the political arena (and in the media) for more troops, and he ignored them all, so one suspects he was not looking too hard for challenges to his views. Indeed, journalistic accounts have made clear that, far from being open to expanding the American troop presence, Rumsfeld relentlessly pushed his generals to consider further reductions. Rumsfeld’s memoir suggests that he was not averse to outside inputs—as long as they told him what he wanted to hear. Thus he commends a study prepared in 2006 by Mike Vickers, a former CIA and Special Forces officer who was then working at a Washington think tank and who was subsequently appointed as an assistant secretary of defense for special operations and low-intensity conflict. (He is now undersecretary of defense for intelligence.) Vickers argued that increasing force levels was “highly unlikely to be decisive” and that it was much better to “begin and continue the drawdown of U.S. forces while the insurgency is still raging.” Rumsfeld notes: “I found the Vickers proposal to be persuasive.” He even brought the Vickers paper and its author to the president and recommended that he implement its conclusions. Yet he now attempts to soft-pedal his opposition to the surge, referring to himself as a “latecomer in supporting the surge”, as if he ever supported it at all, instead of simply accepting it as a fait accompli on his way out the door. Even as late as December 8, 2006, when Bush was already strongly leaning in favor of sending more troops to Iraq, Rumsfeld wrote the president a memo (it is posted on his website) counseling that “coalition forces [should] reduce their presence and activities in major [Iraqi] cities” and give Iraqi security forces primary responsibility “for quelling sectarian violence”: pretty much the opposite of the surge strategy. In light of his die-hard opposition to the surge, it is almost comical that Rumsfeld now suggests that he was responsible for its ultimate success because he supposedly encouraged the contacts with the Sunni tribes that led to the formation of the pro-government militia which came to be known as the Sons of Iraq. In reality, the crucial outreach was made by Army Colonel Sean MacFarland, the brigade commander in Ramadi in 2006, who acted on his own initiative. Rumsfeld’s description of the strategy adopted by General David Petraeus in 2007 is constructed very artfully and very deceptively. Petraeus, he writes, “believed it was time to emphasize protecting the population now that the Sunni tribal leaders had decided to break with al-Qaida and needed the U.S. military to shield them from the jihadists’ retribution.” This suggests that the strategy of protecting the population could not have worked before 2007, when the sheikhs began to defect, and that, by inference, Rumsfeld was right to resist its implementation earlier. Obviously we can never know if “the surge”—meaning an expansion of troop numbers and the adoption of a population-centric counterinsurgency strategy—might have worked earlier, but the odds are that it would have done so. Certainly there had been earlier expressions of dissatisfaction in the Sunni community with Al Qaeda in Iraq, but they had been ruthlessly snuffed out by AQI because we did so little to protect the population. Contrary to Rumsfeld’s sly insinuation that Petraeus only came to favor a counterinsurgency strategy in 2007, Petraeus had been in favor of such an approach all along. And such a strategy had paid spectacular dividends in 2005-2006 in the northern city of Tal Afar, which Colonel H.R. McMaster’s Third Armored Cavalry Regiment had pacified before the beginning of the Anbar Awakening. But such isolated successes were not reinforced or expanded. Abizaid, Casey, and Rumsfeld remained locked into a dogmatic and wrong-headed “light footprint” approach right up until the bitter end. Bush was only able to implement the surge by firing all of them, a decision that should have been taken years earlier. There were many tragedies in the Rumsfeld years. Worst of all were the lives lost, the bodies mangled, the countries devastated, because of his terrible decisions. But among the many other casualties of the wars in Iraq and Afghanistan was the reputation of a man who prior to the Bush administration had enjoyed renown as one of the Republican Party’s wise men. Now his name will be inextricably bound up with the unraveling of the Bush administration’s post-9/11 foreign policy—with Abu Ghraib and “stuff happens.” Bush seems to be enjoying a rebound in public affections, thanks in large part to the vindication of two of his most controversial strategies—the surge in Iraq and the “freedom agenda” across the Middle East. Rumsfeld, who opposed both policies, is unlikely to enjoy any such redemption. He will now be remembered as an awful Secretary of Defense and as an even worse memoirist. It is a fate for which he can blame no one but himself—although I would not be surprised to hear him in a few years’ time attributing his book’s shortcomings to his ghostwriters and his researchers. Max Boot is the Jeane J. Kirkpatrick Senior Fellow in National Security Studies at the Council on Foreign Relations. The author of The Savage Wars of Peace: Small Wars and the Rise of American Power and War Made New: Technology, Warfare, and the Course of History, 1500 to Today, he is now completing a history of guerrilla warfare and terrorism.